"Since its inception in 1948, the OAS has been subjugated to Washington's interests. … The formation of the Community of Latin American and Caribbean States concludes a long cycle of seeking autonomy from the imperial center. Mexico and Central America will no longer be pulled exclusively from the North." 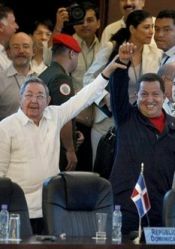 Cuba President Raul Castro and Venezuela President Hugo Chavez at closing ceremonies for the launch of what is being called the Community of Latin American and Caribbean States. Is this a victory for Hugo Chavez, in his feud with the United States? The creation of the Community of Latin American and Caribbean States is part of a global and continental shift, characterized by the decline of U.S. hegemony and the rise of a group of regional blocs that form part of the new global balance. Preparations for the creation of a body excluding Canada and the United States have been in the works for some time, but they began to more actively take shape a few months after the notable failure of the OAS (Organization of American States) to resolve the crisis sparked by the coup in Honduras, a country that, for the moment, doesn't belong to the newborn organization. The decision, pushed during the past two years by Brazil President Lula, completes a long process of regional empowerment away from the superpower. Let’s look back and observe the profound change this will mean for the region. Since its inception in 1948, the OAS has been subjugated to Washington's interests. When Cuba was expelled from OAS in 1962, not a single member country voted against it to avoid problems with the United States, although six abstained, including Argentina, Brazil and Mexico. The establishment of the Contadora Group (Colombia, Mexico, Panama and Venezuela) in 1983, created to find solutions to Central American civil wars, represents the first attempt to give the region a voice apart from the choir dominated by the White House and the Pentagon. It was the intervention of Swedish Prime Minister Olof Palme that was so decisive in the formation of the Contadora Group, which continued to grow despite its rejection by Washington. In 1990, the Contadora Group was replaced by the Río Group (after it was first renamed the Group of Eight) with the addition of South American countries, plus the Caribbean Community and Central American nations. In 2008, the organization acquired its present composition with the incorporation of Guyana, Haiti and Cuba. 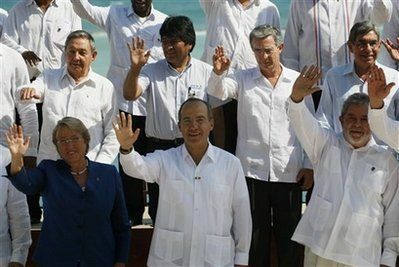 And in 2010, the celebration of its 21st meeting at the Unity Summit in the Riviera Maya was the final step in the gestation of the new Community of States. It is the culmination of two and a half decades of slow construction, which began when the imperial offensive against Nicaragua, El Salvador and Honduras seemed omnipotent, and which coalesced under these new circumstances. Signed by 32 presidents (with only Honduras absent), the Cancún Declaration notes that the goals of the new organization are "to deepen the political, economic, social and cultural integration of our region," defend "multilateralism" and "speak out on the great issues and events on the global agenda." In the section about the economic crisis, the Declaration supports the building of a new regional or sub-regional financial architecture, including, among other things, the ability to accept payments in national currencies, evaluation of the creation of a common currency, as well as cooperation among national banks to promote regional development. The spirit of the document puts a clear emphasis on integration, but without setting any deadlines. However, the two central and most concrete sections that were signed by the presidents are those devoted to "energy" and the "physical integration of infrastructure." It is proposed that confronting the energy challenge by expanding renewable energy sources and "promoting the exchange of expertise and the transfer of technologies that comprise national programs on biofeuls," would, among other things, enable "smaller economies and less developed countries to achieve fair, balanced and consistent access to diverse forms of energy." Regarding infrastructure, the proposal is to intensify work on connectivity and air, sea, river and ground transport, as well as intermodal transport [door-to-door movement of goods under the responsibility of a single transport operator]. Speaking of integration in terms of infrastructure and biofuels, one has to think of Brazil, which leads the region in both categories and is the foremost producer of ethanol in the world, along with the United States. But the document also has a section on "natural disasters," in which it calls for the creation of mechanisms "to provide a rapid, adequate and coordinated regional response." One can again detect here the hand of Brazil, scolded twice after the anemic reaction of the OAS to the Honduras situation and then with the brutal intervention-invasion of the U.S. Fourth Fleet in Haiti. While the Community of Latin American and Caribbean States is still at the stage of a declaration of intent, the first tangible steps of which will come when statutes are adopted at summits in Caracas (2011) and Chile (2012), the most important thing is the mere fact that it has been initiated. Its creation should be viewed from three angles. In the short term, this puts a break on the repositioning of the United States in Colombia and Panama with plans for 11 military bases, but also in Honduras and Haiti. Let’s keep in mind that when Colombia's attack on Ecuador occurred in March 2008, with the bombing of the camp of [FARC leader] Raúl Reyes, the process of creating UNASUR (Union of South American Nations) and the South American Defense Council accelerated. The second issue is long term: the formation of the Community of Latin American and Caribbean States concludes a long cycle of seeking autonomy from the imperial center. It's no coincidence that two great steps were taken during periods of grave tension: The Central American wars of 25 years ago and the economic crisis and global polarization of today. The third angle is geopolitical. Mexico and Central America will no longer be pulled exclusively from the North. The regional bloc confronts many problems and internal contradictions that will slow it down. But none of these have impeded it from taking shape since the early 1980s, in a situation that began with the great weight and presence of the United States, which at first expanded and which is now beginning to consolidate. The long term is going about its work; slowly but inexorably, it pulverized the short term.